In addition to the famous island of Bali with stunning natural attractions, it is incomplete if you are in Bali and try various Balinese culinary varieties. Balinese specialties are now phenomenal because they have unique local flavors, fancy spices, and unusual cooking methods. Well, for you, culinary love is perfect to try and taste all of these foods. Here they are tastiest best seafood in Jimbaran Bali you must try it. Every village in Bali has its own chief cook called be lawa. Be Lawa is responsible for leading a joint cooking ritual starting from compiling a shopping list, determining the portion of dishes, arranging the flow of the cooking process and so on. Be happy from a certain village, you can also be asked to become the chief cook at another place and can be a judge during a cooking competition in Bali. Just for your recommendation are delicious best foods in Jimbaran Bali. The ingredients used for cooking in traditional Balinese ceremonies are chosen based on Tattwa Darsana or Sila Sasana, who recommend using animal meat from land, water, and air as offerings. This does sound unusual and strange. In ancient times, turtle meat was often used as a dish for traditional ceremonies. But now, considering turtles are protected animals, the capture of turtles for the sake of traditional ceremonies must go through a permit in the form of a letter signed by religious leaders and related agencies. This is so that there will be no illegal hunting of turtles in the wild. One of the other facts about Bali food is that people in Bali often use pork in the form of beating or bolster pork in important rituals such as examples of wedding and funeral rituals. Cooked pork is usually left intact because or is still complete, because Balinese beliefs are said to be, the animals used as offerings must not be cut. Currently, pork bolster dishes are not only found during traditional ceremonies but also in many places to eat in Bali. Hence top and famously delicious food in Bali Indonesia you can reserve. One of the menus that must be presented during religious and customary ceremonies is lawar. Lawar is a dish in every traditional ceremony or celebration in Bali which is made from minced meat, vegetables, coconut and a number of herbs. There are several types of lawar, namely real lawar (red and made of blood), white lawar, penyon lawar and green lawar. Very unit and only found on the island of Bali. One fact about Bali food is not recommended to consume meat from cattle. There are many versions of the reasons why Hindus are not allowed to eat beef. One of them is closely related to the teaching to respect ‘mother’, not only biological mothers but also ‘mothers’ milk. Cows as animals whose milk is widely used by humans become animals which they deserve to be respected by not eating meat. And until now cows have become sacred animals for residents in Bali. The following are the most common food in Bali with authentic taste. A very unique habit that only exists in Bali. In certain events, those who are required to cook dishes for the ceremony are men. The men in a village, shoulder to shoulder cooking dishes for the ceremony, while the women got the task of making handicrafts for offerings. No wonder the men can explain the making of lawar or bolster pigs in detail to curious tourists. And this tradition is still being carried out. The Hindu religious beliefs adopted, made Balinese people believe that food was one of the things offered to the gods. The use of food as an offering to the god is not only done during religious ceremonies but also in daily life. When visiting Bali, you will often find offerings placed in front of the house or in many places in Bali every day. This is what has become a tradition and regards it as one of the teachings of their religion. The menu that you must try is delicious and popular foods to Eat in Bali. In another version of Balinese salad, this one uses bee larvae. Crispy larvae are extracted from beehives by boiling nests, and spices of commonly used lawar mixes and raw young papaya are then added to the mixture, resulting in a mild, sweet, crunchy, spicy salad. Beehives are not commonly found on the market and are increasingly difficult. As a result, this surprisingly delicious menu of dishes has become a rare delicacy. This food is believed to be a blood pressure-lowering drug and good for body health. The following facts about Bali food are unique menus of milk satay from cows. This menu is only reserved for Balinese who are Muslim because this menu can only be found in the fasting month or the month of Ramadan. Satay or satay is a word used to describe every food item prepared and served with a skewer. This type of satay is different from another satay because it is made from white meat, with its elastic texture. Following are menu choices best seafood restaurants in Bali Jimbaran. If you go to Bali and order some food menus in the restaurant, don’t be surprised if the bill will get a high number. Because the restaurant tax in Bali is very large, reaching 21%. So before you decide you will eat in an expensive restaurant, find out first the tax costs and also the menu prices do not let that make your wallet pocket conceded. 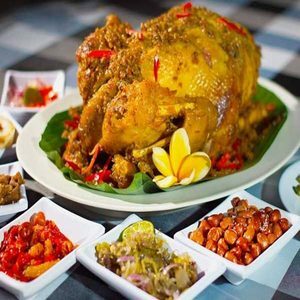 The famous Balinese food menu is betutu chicken. Chicken dish spiced with spices – remoah in the chicken belly, with spicy texture and wrapped in leaves. Then the chicken menu is baked using medium heat until the condition is ripe and smells good. Hence are recommended places of the best food in Jimbaran Bali. The next one from the typical Balinese food menu is the unusual rujak menu. This one-piece meal consists of slices of fruit such as mango, bengkoang, and so on. But what makes it unique is the sauce mixed with tuna as a mixture, it tastes spicy and fresh. For you food lovers, you can try this new menu, which is only in Bali. The Jinggo rice food menu is rice served in the form of adult handcuffs, while the side dishes consist of shredded chicken meat, fried noodles, and fried tempeh. The uniqueness of Nasi Jinggo is the packaging of banana leaves and sambal which is super spicy. Suitable for those of you who like the spicy flavor and complete and healthy food. Nasi Tepeng is a typical food from Gianyar which is served as soft as a puree. A mixture of Balinese spices which are doused on rice is the main attraction. With a spicy taste that will make you try it. The mixed ingredients consist of long bean daro, kidney beans, young jackfruit, eggplant, moringa leaves, and grated coconut are some vegetables that often complement the Rice Tepeng. While for the side dishes there are usually eggs and shredded fried chicken. The way of serving is also very unique, namely by using banana leaves as the base. Here is the best food restaurant in Bali Legian you must try!. Hopefully, the explanation of the facts about Bali food becomes your recommendation to find out the uniqueness and characteristics of the menu on the island of the Gods.